Resonating oscillations of a planet's atmosphere caused by gravitational tides and heating from its star could prevent a planet's rotation from steadily slowing over time, according to new research by Caleb Scharf, who is the Director of Astrobiology at Columbia University. His findings suggest that the effect is enhanced for a planet with an atmosphere that has been oxygenated by life, and the resulting 'atmospheric tides' could even act as a biosignature. Tides can distort a planet's mass, which in turn affects its rotation. We're most familiar with gravitational tides, which on Earth we feel from the gravity of the Moon and the Sun. These gravitational tides create bulges as Earth spins, and the Moon and Sun tug on those bulges, slowing the spin. By contrast, atmospheric tides, sometimes called thermal or solar tides, occur when sunlight heats the surface and air on Earth's daytime side. 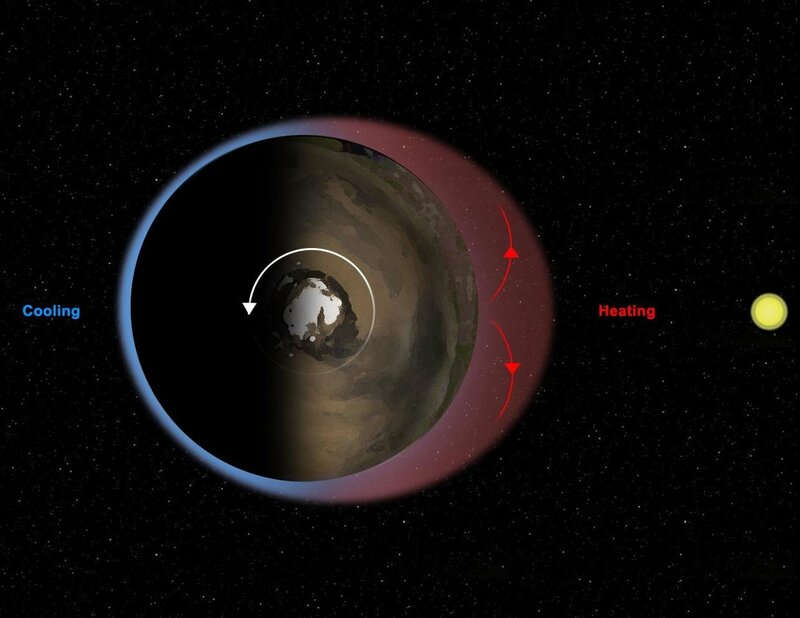 That heating shifts the atmosphere's mass from the hottest point to cooler points on the planet. As with gravitational tides, atmospheric tides cause bulges that are vulnerable to gravitational pulls. Those bulges subtly change the shape of Earth's atmosphere, stretching it from a sphere to something slightly less symmetrical and more elliptical. Scharf suggests imagining a 'handle' on Earth, and that forces pulling on the atmospheric handle can then help speed up or slow down the planet's rotation. Usually, the effects produced by these thermal tidal forces are relatively small, but the effects can be increased in certain circumstances, such as in resonances. These are natural vibrational frequencies that describe the undulating movement of bridges in the wind, or being pushed higher and higher on a swing. Atmospheric redistribution becomes amplified when the planet's rotation rate matches the natural frequency of the atmosphere's oscillation. Scharf uses another metaphor to explain resonance: "It's like playing a violin," he tells Astrobiology Magazine. 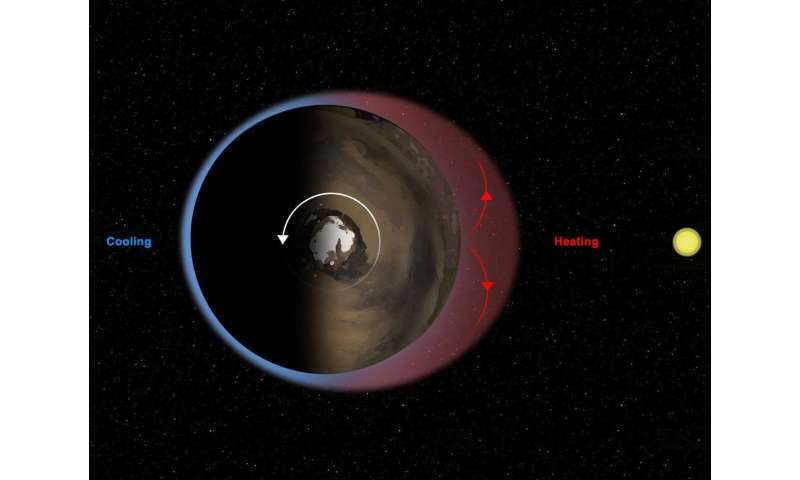 "The atmosphere is a violin string wrapped around the planet. If you draw the bow at the proper speed across the string, you get the right note and the loudest sound." Scientists believe resonance occurred with Earth when its days were about 21 hours long. That day length would have created a peak in the atmospheric movement, which means it would have felt the strongest tidal pulls from the Sun and the Moon, creating a particularly big 'handle' and maximum torque. At that resonance, the influence of a star over a planet's atmosphere is at its largest, as are the effects on the planet's rotation. A phenomenon called 'resonant trapping' can occur when the opposing forces exerted on the atmospheric handle, and by the planet's usual gravitational tides, reach equilibrium, locking in the planet's rotation rate. According to Scharf, research suggests that Earth may have been resonantly trapped at the 21-hour day length for "hundreds of millions of years," perhaps in the Precambrian Era over 500 million years ago. The effects of resonant trapping are difficult to measure by themselves, but in general Scharf notes that planets with faster rotations have hotter equators and cooler poles. Being resonantly trapped may have affected Earth's climate, but more important is the role of resonant trappingin climate evolution. Resonance can be (and in the case of Earth would by necessity have been) broken by temperature fluctuations, such as a rapid warming after a deep freeze, which would re-initiate the increasing of the day length over millions of years as a planet's rotation resumes slowing down. For instance, it's possible that 3 to 4 billion years ago, Earth had a 12-hour day, and that over time it lengthened to 24 hours. 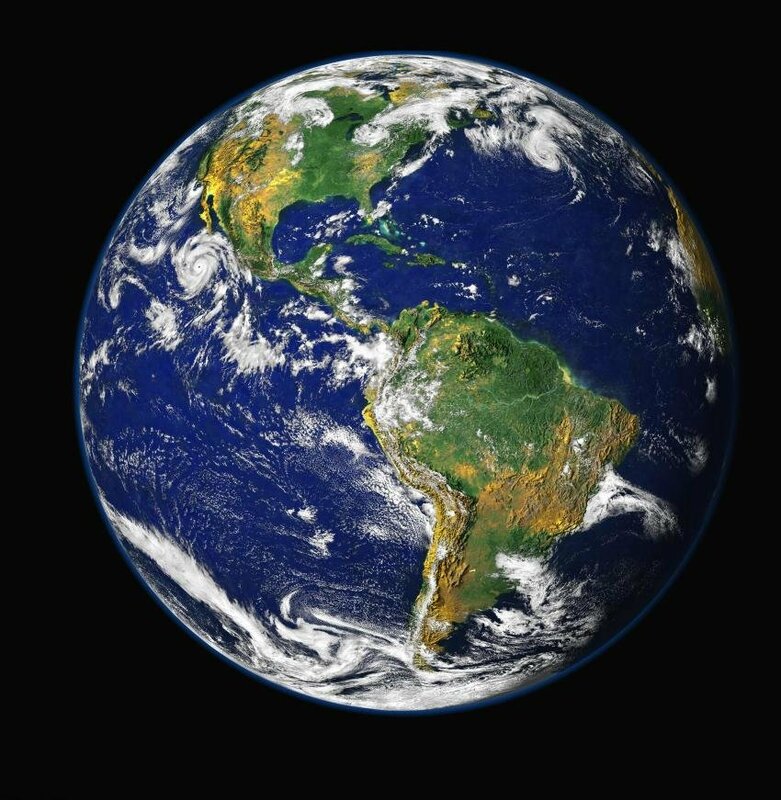 At some point in the distant future, an Earth day could be longer than 24 hours. Since most planets experience gravitational tides that could affect their rotation, Scharf believes other rocky planets would eventually experience resonant trapping, resulting in a day-length being held constant for lengthy amounts of time. Rory Barnes, a professor at the University of Washington's NASA Virtual Planetary Laboratory, agrees that this process may be widespread. "While Scharf reproduced past results for Earth, his model of this complicated phenomena is simple and elegant," he says. "However, it's hard to say conclusively what the effects on any specific planet might be, given the complicating influence of climates, atmospheric conditions, size, etc. But Scharf's first-order attempt to disentangle these factors provides ideas for further refinement." One particularly interesting implication of Scharf's work is the possibility that biological activity could also affect a planet's rotation. Molecules such as ozone make the atmosphere warmer, which makes thermal tides stronger and shifts the resonance to shorter day-lengths. If life on a planet produces oxygen, the planet would accumulate ozone that promotes resonant trapping sooner in a planet's history. Such possibilities "all depend on the sequence of events," says Scharf. If Earth was in the midst of a resonance, ozone increases could break it; if Earth had already experienced resonance, it could enter that state again. A positive feedback for life? The million-dollar question is whether the rotational alterations produced by oxygenation or ozone would be conducive to life. Is this a positive feedback process that helps life influence its planetary environment in such a way that helps propagate that life? Scharf says it's too early to say for sure, but if biological activity can help lock in the resonant state, the presence of life could generate a feedback loop. 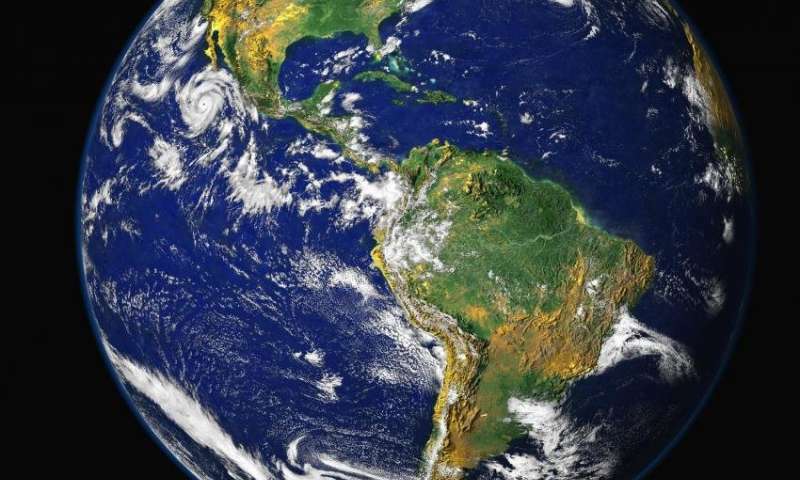 If scientists could obtain more data on the evolution of Earth's rotation over the past four billion years, they could "compare it to our data on atmospheric oxygenation and look for correlations that might suggest the effects of oxygenation on resonant trapping – which would be pretty staggering, but quite possible," says Scharf. Barnes agrees, calling this a "provocative idea that merits further study." Another idea for future examination is whether planetary rotation rates could provide circumstantial support for the potential habitability of a planet. "Detecting the rotation rates of planets is incredibly difficult," says Scharf, "but given the advances in exoplanetary sciences, maybe there's a way to do it." Even if scientists could figure out how to measure the rotation rate of rocky planets, Scharf doubts they would find a 'smoking gun' that causally connects to the presence of biological life. However, rotation rate calculations could be one of the many tools astrobiologists use to search for planets that support life. Barnes would love to see "an experiment that isolates the role of biology on a planet's rotation rate and potential habitability," but in the meantime, he'll be adding rotation rate observations to his extraterrestrial checklist.